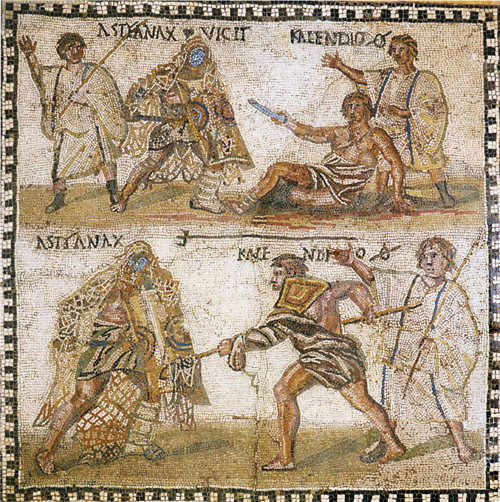 Gladiatorial shows turned war into a game, preserved an atmosphere of violence in time of peace, and functioned as a political theatre which allowed confrontation between rulers and ruled. Rome was a warrior state. After the defeat of Carthage in 201 BC, Rome embarked on two centuries of almost continuous imperial expansion. By the end of this period, Rome controlled the whole of the Mediterranean basin and much of north-western Europe. The population of her empire, at between 50 and 60 million people, constituted perhaps one-fifth or one-sixth of the world's then population. Victorious conquest had been bought at a huge price, measured in human suffering, carnage, and money. The costs were borne by tens of thousands of conquered peoples, who paid taxes to the Roman state, by slaves captured in war and transported to Italy, and by Roman soldiers who served long years fighting overseas.